What does Beloved Community look like? On our pilgrimage to Israel this fall, Gary, our guide, a devout Jewish man, put on his tefellin as we were sitting amidst the stones of the Temple and he shared stories about his children’s bar mitzvahs and the meaning of his religious practices. We had just wandered around the Temple Mount and the Dome of the Rock and felt the mystery of these religions woven together, just as our spiritual experiences and longings began to be interwoven with Gary’s. On another day, we shared a simple meal with Daoud Nassar and his family at the Tent of Nations, where they shared their faith and commitment to building bridges across the conflicts of the Holy Land. As we spent time with rabbis and Palestinian Christians, we heard truths that didn’t fit together and had to have hard conversations with one another, stay with our discomfort and continue to seek relationship over being right. As we journeyed together, we sought to find truth that transcends our personal piety and to practice loving our neighbor even when we didn’t understand our neighbor. These experiences of relationships across culture and tradition, change us. I think as we live into our commitment as a church to Becoming Beloved Community, it is important for us to realize that Beloved Community transcends race, religion, nationality, culture and social class. It is a call to authentic community or “common ground” as Thurman described the root of our shared humanity and spiritual nature. 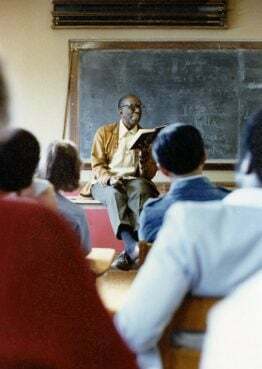 Howard Thurman went on to found the first interfaith and inter-racial congregation in the U.S., the Church for the Fellowship of All Peoples. This was an attempt to discover that meaningful experiences of spiritual unity could compel people toward a different future. In February, we gathered with 30 leaders from around the diocese to begin learning together what Becoming Beloved Community might mean for us, and for our engagement in our neighborhoods, relationships, and common life. We are discovering that it is both challenging and joy-filled and requires us to make commitments to a kind of inner spiritual journey that will change us. The work of Becoming Beloved Community is not a program, but a way of being human. It is in these experiences, where we move beyond our own culture and way of life, that we can begin to see glimpses of God’s dream. Like Thurman’s encounter with Ghandi, we realize that none of us has the whole truth, but each of us has something to offer and something to learn. We discover authentic community and the possibility of a new world emerging. I hope this issue of Connections points to the ways that beloved community is emerging in our time and that you hear a call to you to find opportunities to commit to this journey in your life. This was first printed in our diocesan magazine, Connections. For more articles from Connections, click here.Or to learn about our Becoming Beloved Community work, go to http://dsobeloved.org/. Posted in Featured and tagged with becoming beloved community; pilgrimage, Community, relationships, Spiritual Practice. RSS 2.0 feed.